The figure shows the whole brain of the rat. 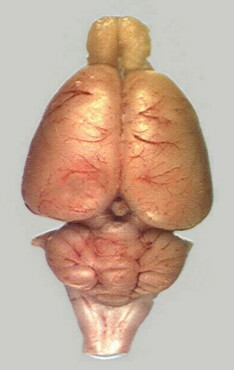 Labeled sections of the mouse brain can be accessed from the Allen Brain Atlas. See also the book The Rat Brain in Stereotaxic Coordinates by C. Watson and G.T. Paxinos. Wistar Albino: Developed at the Wistar Institute. Wide head, long ears, tail length always less that the body length. Sprague-Dawley Albino: Developed at Sprague-Dawley farms, Wisconsin. Longer and narrower head than Wistar, longer tail, which may equal or be longer than the body length. Long-Evans or Lister Hooded: Developed by Drs. Long and Evans in 1915 by cross-breeding Wistar albino females with a wild gray male. A smaller variety, white with black (or occasionally brown) hood over head and back of neck, with a line down the back. *Please note that all procedures involving laboratory rats follow NIH Guidelines for the humane care and use of laboratory animals.